An elegant hill-top refuge, Villa Arboleda offers a stunning visual experience of the Dominican Republic’s Samana Peninsula. 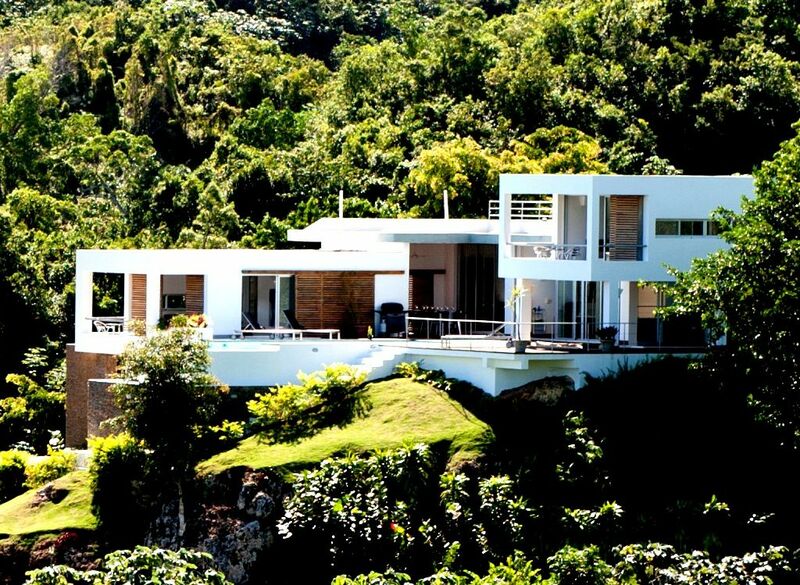 Nestled high in the luxuriant tropical hills of the beach-side resort town of Las Terrenas, this spectacular home was inspired by the style of Le Corbusier's Villa Savoye. Beautifully designed, with five bedrooms, three and a half bathrooms, and expansive outdoor space, Villa Arboleda can be your ideal vacation get-away in the jungle. Villa Arboleda has expansive outdoor space, which includes a poolside patio; a shaded outdoor lounge for relaxation, morning coffee or evening cocktails and gardens surrounding the house. Guest Services: Our local property manager can arrange for extra services, including airport pickup and transfer; an arrival refreshment package, so you don't have to worry about shopping for groceries for your first breakfast; car hire and delivery to the house; weekly maid service; and a weekly change of towels and sheets. These services are optional and additional to the cost of the house. Villa Arboleda is equipped with an external bedroom and bath to house service staff, if onsite staff is requested or traveling with you. We had a great time in the villa. It has a very beautiful view of the coast and sorounding nature is amazing. Beautiful views and warm ocean breezes!! Beautiful views and warm ocean breezes are just two of the wonderful features of this villa. We stayed for one week and wish we had booked to stay longer. The setting is stunning and very private which made our stay completely relaxing. Noella, the property manager, was wonderful - she was very friendly and discrete and arranged to have the fridge stocked with requested items before we arrived. The owners were very responsive to questions before our arrival which made finding the villa very straight forward. Villa Arboleda is very close to Las Terrenas and it is also easy to get to Samana for whale watching and to Las Galeras for the beautiful beach there. We would highly recommend this villa and hope to return again. Amazing house for an amazing time! This was our second time in Las Terrenas, and we're so glad we chose this rental. The previous reviews are all on the money. The views from Villa Arboleda are incredible. The property manager was very flexible in allowing us to check in early and then waited for us after an unforeseen flight delay. On our last night we hired the chef, Simon, who is a fantastic cook and can make anything to your heart's content. I recommend hiring him, but not on your last night (you WILL have leftovers!). Many thanks to Justin, Jennifer, and Noelia for making our stay a memorable one. Interlude: From the picturesque landscape to the totality of awe-inspiring local experience, we would highly recommend the Hilltop Refuge over any resort experience. It's proximity to El Limón, Las Terranas, and Cosón, is only a stone-throw in regards to the experiences you will be subject. It is difficult to explain in a word-limited exposé, or even capture in a picture, the... utter magnificence of the world you are immersed in here. For those more, or less traveled, you'll find something here to charm and entice your appetite, sense of adventure, and the like. The beaches are plenty, local cuisine to die for, and cultural omnipresence evident. You will make new friends, be they expats or naturalized- and the smiles will survive in your mind for a lifetime. The property manager, Noelia, is a total doll! She is an enthusiastic, fun, and very "you-conscious" young lady and we feel very excited to have made a new friend! You'll have a personal concierge come each week-day to clean the sparkling pool, whom is very keen to your privacy and won't be a bother at all. We embraced his presence and had breakfast waiting for him. You'll be greeted by the daily hustle and bustle of motorbikes and commerce, which is something you must prepare yourself for, if per se, you are not used to driving in conditions very opposite that of the US or EU. None is meant in jest, so don't operate your vehicle as if it were so. As mentioned in other experiences, you absolutely should rent a 4X4 vehicle for no other case than ease of traversing the winding, but AMAZING drive to the residence. It is not impossible to do so with 2WD, but the terrain is something you don't want a compact car to have to endure. We lost power several times at the residence (which means WiFi as well), but it is hardly worth mentioning. What's worth mentioning in regards to this instance, if not discernible in the aforementioned text, is: Epilogue: The window to a world worth peering is not that of your iPad or electronic device. These windows exist in abundance at Hilltop Refuge (they really do- the whole house opens up). onsider your time here as a synapse in which the outside world can wait for your posting. Live, love, expand your boundaries, and ENJOY what has been created here. Your pictures and experiences will earn the +1's and Likes of your social peers, just don't commit yourself to reporting and miss the opportunity of living in the moments that will be so special to you and your entourage. Our family had a fantastic Christmas in this beautiful, spacious home. The hosts were extremely responsive and flexible, and even helped arrange for us to already have groceries there and a meal cooked for us, as we arrived on Christmas Eve. We especially loved the beautiful swimming pool, with views out over the green hills, and the outdoor/indoor spaces for meals. Even the details of the house's decor--modern, bright and clean--were absolutely ideal. Nearly every bedroom also had its own private balcony space, making it easy to alternate between time alone and time together as a group. Just a gorgeous, fantastic place to stay, we recommend it highly. Las Terrenas is a picturesque town on the north east coast of the DR, on the Samana Peninsula. 'LT' is a special place, and not just because of its stunning beauty. The town offers 17 kilometers of beaches, mostly unpopulated, by contrast to much of the north coast, where wall-to-wall deckchairs line fairly small strips of beach. LT is also set apart because of its unique cultural mix -- it is made up of 2,000 foreign-born permanent residents out of a total of 15,000 in the town. This gives LT a particularly European flair. Things to do: Our favorite answer is 'nothing' -- and that's the way we like it. A towel, sunscreen and a good book and we're set. But for the more actively inclined, things to do include whale watching -- on the south side of the peninsula is the Bay of Samana (January and February are prime times); wind sports, including kite sailing; restaurants.